Two cosmonauts are getting ready for the first spacewalk from the International Space Station since March. Two NASA astronauts are also working to bring a U.S. spacesuit back to service. The three newest Expedition 44 crew members joined Commander Gennady Padalka during their afternoon for a familiarization session with emergency equipment inside the orbital lab. Having arrived just last week, new flight engineers Oleg Kononenko, Kjell Lindgren and Kimiya Yui are still getting used to their new home in space. Padalka and One-Year crew member Mikhail Kornienko checked out Russian spacesuit gear ahead of an Aug. 10 spacewalk. The duo will replace external experiments and photograph the exterior condition of the space station’s Russian segment. 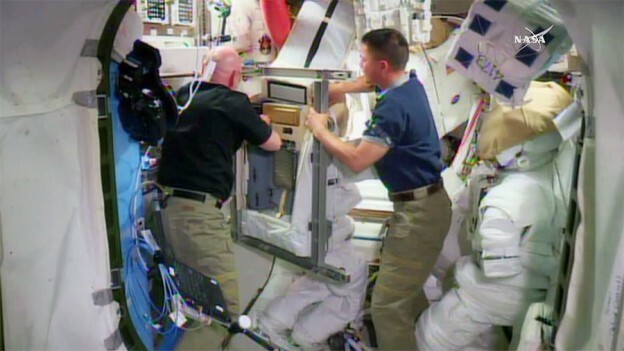 Lindgren and One-Year crew member Scott Kelly worked on a U.S. spacesuit replacing internal parts to return the unit to service. Kelly also continued more research for the Twins study comparing him to his Earth-bound twin brother and ex-astronaut Mark Kelly. Good luck in space. My 4 year old daughter was very excited to see the space station pass over tonight.